Happy Birthday crb11! This cache is a birthday present to Colin, placed on his birthday following a special request for a cache to fill a required space in his "placed on" date grid. Much delayed, but finally done. 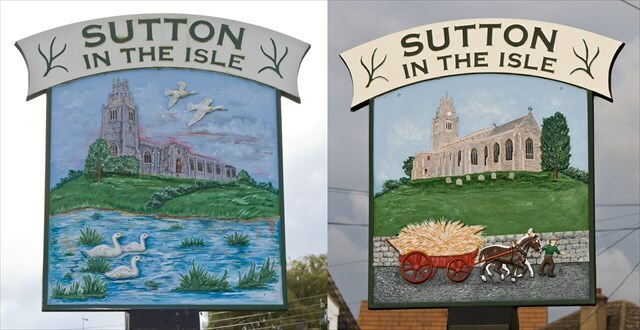 Here is a short history of Sutton, some of it reflected in the village sign, and much of it the subject of other caches around the village. Sutton-in-the-Isle, commonly referred to simply as Sutton, is a parish and village in the county of Cambridgeshire in England, near the city of Ely. The "in-the-Isle" suffix refers to the fact that the village is part of the Isle of Ely, once an island in The Fens. The village was mentioned in the Domesday Book of 1086, identified as Sudtone. There were then 9 sokemen, 8 villeins (each with 7.5 acres), 15 cotters and 7 serfs. In 1109, the charter 51 of Bishop Hervey included Suttune in the lands recorded as being conferred upon the Cathedral Priory of Ely. According to the Ely Diocesan Register, the Manor of Sutton was established in 1292 and belonged to the Priory. The vicarage of St Andrew's was instituted in 1254 and the re-building of the church of St. Andrew's was started between 1350 and 1360. It was substantially completed by 1370 and has a distinctively-shaped tower that is often described as being in the shape of a pepperpot. Several non-conformist chapels once also existed in the village. These included a Methodist chapel constructed in 1790, following a visit by John Wesley in 1774, and a Baptist chapel constructed in the same century. Both of these closed in recent decades, leaving the Anglican church as the sole place of worship. By 1599, the village was so prosperous that it became known as “Golden Sutton”. In 1800, it had a population of about 950, quickly rising to 1,862 by 1851. Although a school had been established in the village in 1579, under William Heye, it was not until 1860 that the first purpose-built school-building opened. During the 1960s, the Sutton Gault hamlet was the site of one of the world's first Tracked Hovercraft, designed by Eric Laithwaite. This hovertrain was propelled by a linear induction motor and ran alongside the Old Bedford River, on a one-mile section of air-cushion trackway. The village has known a variety of businesses throughout its history. It was once well-known for fruit-growing, but has also been a place for cheese-production. Later, it manufactured road sweepers and now it hosts a monthly auction of construction and agricultural equipment, which is the largest of its kind in Europe. The cache was placed on crb11's birthday, and following a series of delays, I returned to check before submitting. And it was gone - along with all the ivy from the tree it was originally in. It was replaced in a new location. That one was too close to the school, and I had second thoughts about the safety of the third location. The 4th location was too close to another cache... so now in its 5th spot...hope it stays! .•:*¨¨*:•..•:*¨¨*:•. Congratulations on your FTF Wystan and Mrs Wystan! .•:*¨¨*:•..•:*¨¨*:•.